Sometimes I wonder if the Governing Body remembers their own history. But then again, i’ve come to expect them to be less than honest, which is quite unfortunate. Though there might be some who would love nothing more than to have a “gotcha” moment in pointing out yet another less-than-honest statement by the Governing Body, I would much rather them demonstrate some humility. Given the recent false prediction by Harold Camping, I was actually hoping the Governing Body would leave this one alone. Otherwise, it would not be the first time they have applied a double standard in accusing others of making false predictions that didn’t come to pass. First of all, this statement is not completely accurate regarding Camping’s prediction. 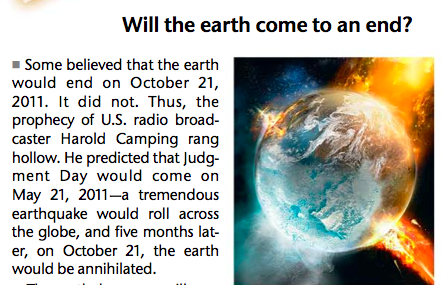 Like the Watchtower’s pre-1914 predictions, Camping’s was based upon his faulty interpretation of the Scriptures. And as far as I know, Camping didn’t claim any type of non-biblical divine revelation that God had personally given to him. In fact, any claims to authority Camping would have made could only pale in comparison to what the Watchtower had and continues to claim for themselves. The point is, the reader of the Watchtower may have gotten the impression that Camping just made up everything or had some type of inspired revelation from God. This is information that I would encourage some to share with their JW friends and family. Do so with caution, humility, and love. But never do so at the expense of the gospel and pointing to Christ as “the way, the truth, and the life.” (John 14:6) Remember, your goal is not to create an ex-JW, but a Christ follower. As stated a few times now, God’s people have often expected the right thing at the wrong time. THis neither marked them as false prophets nor did it remove them from God’s blessing. THink again about the case of Moses who went 40 years too soon to the Israelites and killed in man in hopes that they would grasp that God was giving them salvation at that time by means of him. But, he was 40 years too soon. What happened? Did God reject him? Did Moses expect the wrong thing? Why did God end up using someone who was so tragically wrong and even took a man’s life in his wrong headed view? I’m failing to see how this comment directly correlates to my post. Hmmmm, OK. Tell me why it doesn’t relate. The part about the double standard? That was the whole point of the post. I really would like to address the Moses example in a future post altogether. It’s such a poor parallel, if a parallel at all, to the WT’s failed predictions in light of their claims for themselves. Well sure their expectations rang hollow, but so did Moses’ expectation. That’s my point. So did Nathan’s expectation that David would build the temple. So did Jonah’s expectation that Nineveh would fall in 40 days. So did the Apostles expectation that the kingdom was going to display itself right in front of them. What the WT is no different. They expected the right thing at the wrong time and became presumptuous about promoting a premature expectation. They have never claimed infallibility or inspiration. Only a desire to discern the will of God and to preach the good news of God’s coming kingdom and a willingness to move where the revelation of truth requires us to move, regardless of the consequences. Please demonstrate by quoting the relevant portions of Scripture vs., lets say, the predictions set forth in “The Nations Shall know that I am Jehovah” and let’s see if they really are “no different,” as you put it. Since you are the one claiming that what we have done is different, it should be you to set out exactly why you feel that way. If you see something in the publications that you mention, then please spell it out. I have basically stated my position above. If you think it is inaccurate, you should be the one to demonstrate that. What I claimed is that the WT is presenting a double standard. That is demonstrated in the article. You claim that the Bible authors/characters are “no different.” I believe it is then your burden to demonstrate this with citations. Otherwise, I’m fine with leaving this for the readers to decide, if they are even reason these comments at all. Better that than to doggedly hold onto false pagan teachings such as the Trinity and the concept of eternal torment and others. Peripheral errors are one thing, but core Christian teachings, such as that iterated at Hebrews 6:1,2, which would surely include “who is God” and “everlasting judgment, would be another. What you are basically complaining about in the majority of your posts are nothing more than peripheral error issues, the same kind of errors that individual believers and religious organizations make many times within the scope of their life or existence. What you should really be concerned with is what is true in regards to those elementary teachings mentioned in Hebrews 6:1,2. Perpipheral issues can come and go, as they did with the Israelites and as they did with Christianity. The true test is to determine who has the elementary things in order. Surely you would expect that from the true body of Christ, wouldn’t you? I don’t find “absolute” to be a helpful term here. Did they or didn’t they express specific dates whereby the main event did not come to pass? I fail to see how Camping’s predictions are not of the same nature as the WT’s. Like the WT, I find that setting a date for the end is so careless and naive that it boggles my mind how one can put their trust in that person or group. This is why hardly anyone trusts Camping anymore, and for good reason. As I stated, they never set a specific date as Camping and others have done. There were certain years where their expectations were high, but those things were never written in stone nor declared as infallible. Would you find it hard to put faith in a guy that showed up 40 years to soon to deliver God’s people, killed a man in hopes that you would grasp that God was giving you deliverance, except God wasn’t. And then had to hide and spend 40 years in the wilderness before coming back and claiming the same deliverance again? You’re simply looking at the wrong thing, the wrong criteria. It appears that you are in need of reading the quotes above, taken from the book Rutherford himself wrote. You say there were certain years when their expectations were high BUT that they were not written in stone or declared infallible. However, the evidence says something entirely different. When Rutherford went on his now embarrassing Millions campaign he preached very dogmatically and referred to the events he was foretelling as “undisputable truths.” If one says something is undisputable one in essence is saying infallible. One of those undisputable truths was about how the faithful men of old were to be resurrected in 1925. Which is why he used funds from the Watchtower to build the house Beth Sarim and deeded it to Isaac, Abraham and so on…… because apparently they need a lavish mansion to live in. There are literally many more examples like this one to prove how the Watchtower has indeed been prophetic, dogmatic and ultimately wrong! They apply double standards constantly. If other religious group prove false in some theology they use that to prove how they are wrong and part of false religion lacking of Gods favor but when they are wrong, 1- They never apologize 2- They blame the rank and file and 3- They wrongly apply the verse in the book of Proverbs that there light just keeps getting brighter and they just suddenly had a flash. With all due respect, if you are going to publically defend the society on these issues you should first study, in depth its history and not the watered down version they sell the JW’s but the true un-censored versions. Although they no longer publish those books and mags, with good reason as they are now just an embarrassing reminder of how wrong they have been, one can find them easily with a bit of research.